All-Star teams are selected toward the end of the regular Spring Season. Redondo Sunset will attempt to select 1-2 All-Star teams in each softball division. A “Gold” team, and a “Silver” Team. To be eligible for All-Stars, each player must submit a consideration agreement online by April 28, 2019. To be eligible for All-Stars the player must have participated in 75% of the regular season games per USA rules (please see the standing rules and USA rules for full eligibility rules). Teams are selected by the Managers of each division – there is no additional tryout. Players will be notified by the All-Star manager if they have been selected. Players will be asked to commit to a practice and tournament schedule in order to participate. All-Star teams may begin practicing before the end of the regular season. If selected to an All-Star Team a separate fee (~$225-$275) from the regular season is required to be paid to participate. If selected to an All-Star Team you must volunteer a set number of hours and provide a deposit check, that will be returned after your volunteer duties are met. There are no minimum play rules in All-Stars, though in 6U and 8U all players on the roster are required to hit. For 10U, 12U, and 14U your child is not guaranteed to play in the field or be in the batting order if they make the team. 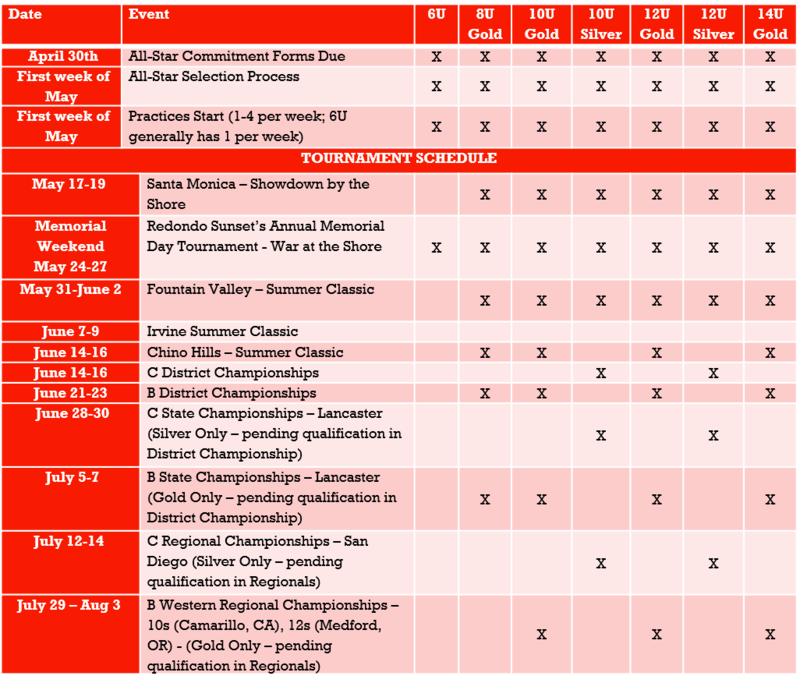 To view the complete Redondo Sunset All-Star Selection Process, see the standing rules under League Documents.